This blog has been unusually quiet for the last few weeks, because quite simply, there has been nothing to report. The warm weather over the Christmas period was followed by a stable high pressure system that resulted in almost no precipitation over the Scottish hills. The lack of snow meant that winter climbing was restricted to easy snow gullies in the highest corries. Although a little exploration has taken place, I am not aware of any new routes harder than Grade II, and many of these climbs would bank out, or even completely disappear, in full winter conditions. So it was something of a relief when the high pressure system finally broke down this week and we have seen some welcome snowfall combined with cold temperatures. 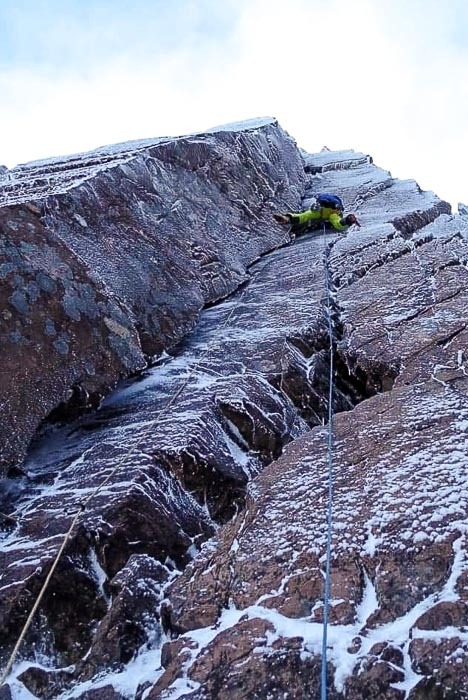 All of a sudden, Scottish winter climbing is back on the cards. I was delighted to receive an email from Willis Morris on January 17, the day the first snows arrived. “Nicholas Wylie and I climbed a possible new route up on Church Door Buttress on Bidean today,” Willis wrote. “It’s on the small needle that rises up out of the centre of Central Gully. We struggled with the first pitches of the routes on the main crag being black, so instead of bailing, we decided to have a wander further up to where the hoar line was. Once we got there, we were pleasantly surprised! Willis and Nicholas called their 35m-long new addition The Lonely Angel and graded it VI,7. The weather has remained cold and settled through the weekend, so after the long drought in winter activity, I expect to be have a more to report early next week! This entry was posted in Commentary, New Routes and tagged Bidean nam Bian, Church Door Buttress, Nicholas Wylie, Willis Morris. Bookmark the permalink.